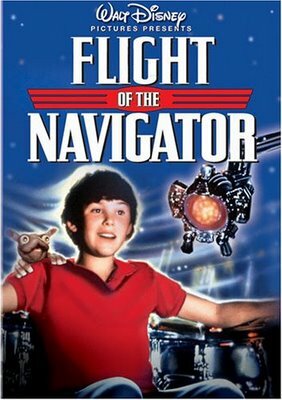 Flight of the Navigator is a 1986 live-action sci-fi film from Walt Disney Pictures and Producers Sales Organization (The Neverending Story, Short Circuitnote which was released the same year). David Freeman, a 12-year-old boy living in 1978, falls into a ravine after searching for his younger brother, and wakes up eight years later — everyone has aged but him and he's apparently been gone all that time. An analysis of his brain reveals hidden schematics and star charts, and David later discovers an alien spaceship that was captured by NASA around the same time he was found. Now he must work with its computer program, which he later calls Max, to figure out what happened to him and get back home. '80s Hair: Carolyn's - discussed with reference to the purple streak therein. Carolyn: You know something? You're a weird kid! David: Me? I'm not the one with the purple hair! Carolyn: Oh... yeah...I went to a concert with some friends last night. 90% of Your Brain: Used to store the star charts in David's head as an experiment. Result? "It leaked." Acrophobic Bird: Averted; when David tells the ship to get 20 miles away from the base, it goes straight up! Adult Fear: The film places appropriate emphasis on the parental fear of one's child disappearing without a trace. Of course, no parent would expect their child to turn up eight years later and still be the same age they were when they disappeared. Inverted with David. He comes home and finds his family no longer lives there, and everything has changed. Any kid watching understands immediately why David breaks down crying from the confusion, panic and terror that hits him all at once. Downplayed with R.A.L.F. the mail delivery robot, whose rudimentary A.I. sometimes malfunctions in harmless ways (according to Carolyn, anyway). Though Max was able to control it to bring David to him. Played straight with Max who got himself into the whole mess (crashed into power lines) in the first place because he was gawking at some daisies. Alien Abduction: David was taken to Phaelon for study. Annoying Younger Sibling: Jeff, until he grows up without David. Now that David's back in his own time, he won't be that much annoying. In the middle of the movie, the now-teenage Jeff apologizes to the still-12 David for all the crap he gave him. Anthropic Principle: The Phaelonians couldn't simply return David to his original time in the beginning of the film, as they feared time travel would vaporize his fragile body. Artificial Intelligence: Max is a robotic A.I. for an entire spaceship. His race is never seen, so the question of whether they are all living machines who achieved Brain Uploading or evolved as Mechanical Lifeforms is never addressed. Artistic License  Physics: When the ship travels 20 miles straight up, David floats up to the ceiling as if in microgravity. In reality, at 20 miles up the Earth's gravity is pretty much just as strong as on the surface (astronauts float because they are falling along with the ship or space station around — it's just that they are traveling sideways fast enough that the Earth curves away beneath them so they never end up hitting the ground). Though this is probably ignored for Rule of Funny. Attention Deficit... Ooh, Shiny! : Max crashes his ship because he was looking at daisies. Bad Future: For David, anyway. NASA only treating him like a test subject, earlier on, he learns that he was declared Legally Dead. And his favorite TV show Starsky & Hutch was cancelled. Bait-and-Switch: The movie opens with that appears to be a flying saucer flying above the city. It soon turns out to be frisbees thrown in a dog contest. Later in the same scene, something floats above the crowd, it was a low-flying blimp. And while David treks through the woods to get Jeff, there's something above the trees: it's a water tower. Big Little Brother: Jeff became this for David. The change is extremely awkward — but thought-provoking — to the both of them. Blatant Lies: "Get back Jack, I've got a gun!" Call-Back: Before David falls into the ravine, a freight train can be heard approaching. After returning to his own time, David wakes up to the sound of the train passing by. The Comically Serious: Max, before being affected by David's humanity. Conspicuous CG: Notably the ship's shapeshifting animations. It's understandable given that this was 1986, and the ship's reflective effect was state-of-the-art at the time. That said, some of the shapeshifting (like the stairs) was actually stop motion. Cool Starship: And one that looks like a watermelon seed. Darker and Edgier: Somewhat, compared to other Disney movies (live-action or animated). The Freemans are somewhat (but not completely) dysfunctional, and the NASA scientists (at least from David's point-of-view) only really see him as a test subject, among other things. note That said, it should be noted that Disney technically didn't make this movie. They merely distributed it on another company (the aforementioned PSO)'s behalf - and outside North America it's not even released by Disney! The '80s: As if music videosnote Which had just become a new thing at the time; it had been five years since MTV had launched. and multiple brands of Coke being the new "in" things which confuse David, or Carolyn's hairdo, wasn't enough to remind viewers exactly which decade David finds himself in, we also have the synthesized soundtrack which practically oozes '80s. David: I didn't mean straight up! I meant along the ground! Extreme Omnivore: One of the aliens on the ship eats David's hat, and might have eaten his head. Max: Don't get too close to them, David. They're hungry. Faster-Than-Light Travel: 560 light years in 2.2 (solar) hours, also used to explain why David hasn't aged. Fish out of Temporal Water: Although it's only been eight years, David has difficulties adjusting to music clips and five brands of Coke. Max's race were so intrigued by the unused mental capacity of humans that they decided to cram all their star charts into David's brain, just to see what would happen. The people are NASA are perfectly willing to keep a kid locked up for life, if that's how long it takes to obtain and decode all of the alien information in his brain. When David manages to escape, the loss of this massive bounty of data is all they lament. Fun with Acronyms: RALF: "Robotic Assistant Labor Facilitator." Genre Savvy: when David is being observed by scientists via a one-way mirror he angrily makes clear that he knows perfectly well what that mirror is there for, because he watches TV. The Ghost: Almost nothing about the residents of Phaelon are revealed, other than their technology. Hearing Voices: David hears the voice of Max calling him to the ship. Humanity Is Infectious: As Max realises to his horror after downloading a copy of the star charts from David. He quickly embraces it. Hyperspace Is a Scary Place: In this case, traveling backwards in time is not a pleasant experience at all. Identity Absorption: Max got a little more data than he bargained for when he scanned David's mind for the star charts. Japanese Tourist: David and Max encounter some of these when Max accidentally takes the ship to Tokyo instead of Fort Lauderdale. Last of His Kind: Puckmaren, who doesn't know that he can't go home because his planet was destroyed by a comet after he was taken. Lawful Stupid: More like Lawful Immoral. The staff of the NASA facility decide to keep David virtually imprisoned indefinitely without regard for the consequences when they realize how much alien data is contained in David's brain. Though the head of the facility may have meant it he'll return him home after 48 hours. Until the alien information changes things. Left Hanging: David ultimately gets his Happy Ending, but one small detail is overlooked. His brain. His subconscious still does whatever it wants to whenever he gets near a computer. Not of much consequence in the 70s. As he goes through his natural life, however, technology becomes more prevalent in the next decade, and he's going to end up, once again, attracting government attention. That might not be the case anymore, since the only reason it happens was because Max downloaded information into his brain. During the middle of the movie, Max reload them back into his memory bank. Machine Monotone: The previously mentioned mail delivery robot R.A.L.F.. R.A.L.F. : "Pardon me, coming through." The Navigator: And this is his flight. Never Grew Up: Not by choice, but David experiences firsthand the consequences of travelling close to the speed of light. Close to the speed of light? If he's traveled 560 Light-years in 2.2 hours, it's safe to assume he rather EXCEEDED the speed of light. And how! Unless scientists in the movie have already increased the speed of light. Older and Wiser: David's brother Jeff grew up to be a pretty cool teenager. On a lesser note, the family dog "Bruiser" may have taken eight years, but he grew from an oblivious puppy who couldn't follow commands to save his life into a competent frisbee-catching dog. Popular History: If we are to believe the filmmakers, The Bee Gees were the only pop group in 1978 that preteens wanted to go see. (So up yours, KISS, Led Zeppelin, Eagles, Aerosmith, Foreigner, Styx, and Van Halen!) What makes it really ludicrous is that the Bee Gees are equated with Twisted Sister. Well, David did say that it was his mother who took him to the concert. She may not approve of those bands or liked the Bee Gees herself and brought him along. Puny Earthling: See Time Travel below. Rip Van Winkle: David loses consciousness for "a second" and wakes up 8 years later. Once the science is explained, this situation doesn't quite fit the trope, but from David's point of view that's what happened. Robo Speak: Max before getting his data back, as exemplified in the second page quote. Sadistic Choice: David can either stay in 1986 and spend the rest of his life as a test subject, or try traveling back to 1978 and risk being vaporized. It's seeing the NASA staffers at his house that convinces him to take his chances on the latter. Sapient Ship: The Trimaxion Drone Ship. Secret Keeper: David's brother knows he's got a small alien creature. Shiny-Looking Spaceships: The Trimaxion Drone Ship is polished silver, inside and out. "He just said he wanted to phone home..."
After absorbing some of the information in David's head, Max briefly starts talking like Scotty. "Two all beef patties, special sauce, lettuce, pickles, onions on a sesame seed bun!" The little girl at the gator farm is wearing an EPCOT Center tee-shirt. Spheroid Dropship: Not quite, but the ship's original form is roughly spherical. Spock Speak: Max originally speaks like this. Starfish Language: David's brain has been filled with data in a totally alien language that would take years to decipher, according to the NASA men. Sufficiently Advanced Alien: The Trimaxion (or Phaelonian?) race has perfected the ability to travel at any speed and travel anywhere at any point in time they wish. Time Dilation: The reason why David goes from 1978 to 1986 without aging a day. Time Travel: Max would normally take his specimens back in time to when they were abducted, but has reluctance at taking David, fearing it would vaporize him since his body is "too fragile". They Would Cut You Up: Not literally, but David realizes he would never be able to live a normal life if he stays in the 80's with the government hounding him, and risks being vaporized to go back. Took a Level in Kindness: Jeff as a teenager. Totally Radical: Max speaks like this after downloading the info from David's brain. Touched by Vorlons: David is never the same again after his trip to Phaelon. 20 Minutes into the Past: 1978, as the movie was made in 1986. Vitriolic Best Buds: After getting his data back, Max trades many barbs with David, yet still is concerned for his welfare and regrets getting him into this mess. Jeff: "You think it's easy for me to believe you're David? You should be 20 years old by now!" *on the computer screen* In analysis mode on Phaelon. What Happened to the Mouse? : Before David was abducted, he was watching a girl he likes through his telescope. She wasn't brought up again, even after he reappeared 8 years later. What Year Is This? : Inverted. David, who's unaware he's traveled 8 years into the future, is asked this by the suspicious police. "See ya later, Navigator! Ha ha!"